First time here? | Meeteez - 100% free dating for Facebook users! Meeteez is a totally FREE dating site exclusively for Facebook users only! There are no charges and there never will be! All you need is a Facebook account and you can start meeting new people in your area! Rather than just meeting people in your own social group or friends social group Meeteez allows you to find new people outside your normal circles! This pop-up requests permission to access your Facebook information to create your account. 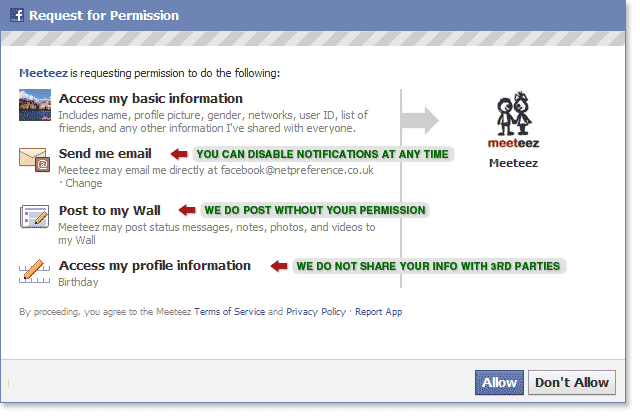 To allow permission and create your Meeteez profile click 'Allow'. You will only need to do this once and and when you click 'Allow' your profile will be created! Note: We DO NOT share your information with 3rd parties, we DO NOT post to your Facebook wall without your permission and you can disable email notifications at ANYTIME. At Meeteez we aim to be as discreet and secure as possible. 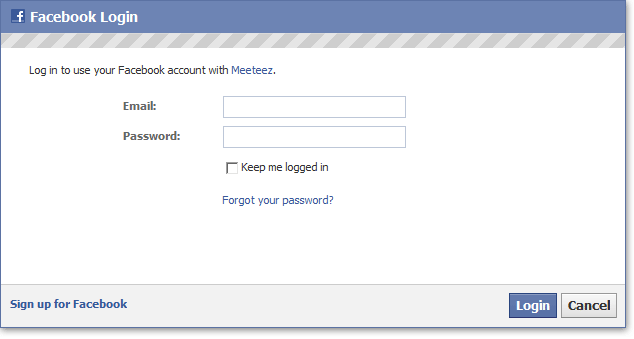 Simply enter your Facebook details to log into Meeteez. To start using Meeteez click here to go back to the homepage.